Australian wines had not been on my radar until few recent events reintroduced them. For the last five years, there had been a decline in Australian wine sales. Finally, that is starting to change. According to Wine-Searcher.com, Australia is now only second to Italy for exports to the U.S., with sales of 16.6 million cases. I attended a dinner at Pebble Beach Food and Wine this past March that took us on an epicurean tour through South Australia, to the regions of Barossa, Clare Valley, Adelaide Hills and Kangaroo Island. With each course of food at the dinner, the meal was paired with an Australian wine, including Hentley Farm Rosé, D’Arenberg DADD Sparkling NV, Yalumba Eden Valley Viognier 2014, D’Arenberg The Feral Fox Pinot Noir 2012, St Hallett Blackwell Shiraz 2013 and Kalleske Clarry’s GSM 2014. It was these wines that began to re-open my eyes to Australian wines. They are no longer just the big, jammy wines but rather beautiful, elegant, fruit-forward wines. South Australia is a region of quality wine producers. They have always been there but finally the U.S. market is getting a chance to taste them. One of these wines is Hentley Farm, a relatively new winery in the Barossa Valley. After trying the rosé at the dinner at Pebble Beach, I had the pleasure to have dinner with the winemaker a few months later and learn more about this winery. Hentley Farm was founded by Keith and Alison Hentschke in the 1990s. Keith Hentschke was focused on site selection and would drive around in his car, looking for the best soil to plant young vines. He found 150 acres where the Greenock Creek runs through in the western edge of the Barossa Valley. The adulating slopes, varying altitudes and the red clay loam soils over limestone make it an ideal spot for Australian red wines. The first wines were released in 2002. Andrew Quin joined Hentley Farm as winemaker in 2008, which was also the first year they made the rosé wine. Quin was raised in Melbourne and studied horticulture. He was working in landscape design in his early 20s when he developed an interest in wine. After working at a small, unknown winery in Australia, he traveled to California to work at St. Francis winery and then spent two vintages in the Languedoc. When he returned to Australia, he chose to settle in Barossa and spent six months at Yalumbu before joining Hentley Farm. Quin was drawn to Barossa because of the “vibrancy of the fruit with the softness of palate.” Barossa is a warmer region and he chooses to pick the wines early in order to let the natural acids come through, also increasing the vibrancy and lowering the alcohol. What sets Hentley Farm apart from other Barossa products, Quin explained, is their site specific wines. “The terroir is the story” of the wines. At Hentley Farm, the vineyard contains five varietals: shiraz, grenache, cabernet sauvignon, zinfandel and a small parcel of viognier. Quin makes more than 20 different wines off of the single estate, each telling a different story. An example of how the wines speak for themselves is with two of the shiraz bottlings. The Beast is 100 percent syrah selected from a single block high on the hill, where the soils are shallow and the sunlight is even. The Beast exhibits great concentration of flavor and richness, with soft grippy tannins. In comparison Beauty is grown on the coolest block on the property, near the creek, and is co-fermented with a small amount of viognier. The Beauty has complex lifted aromatics with a softness and subtlety on the palate. The quality of the wines at Hentley Farm has not gone unnoticed. In 2015, Hentley Farm was designated Winery of the Year by James Halliday, making Quin the youngest winemaker to receive this award. Hopefully Hentley Farm, and other boutique Australian producers, will help re-open your eyes to Australian wines, as it did to mine. Food is art. 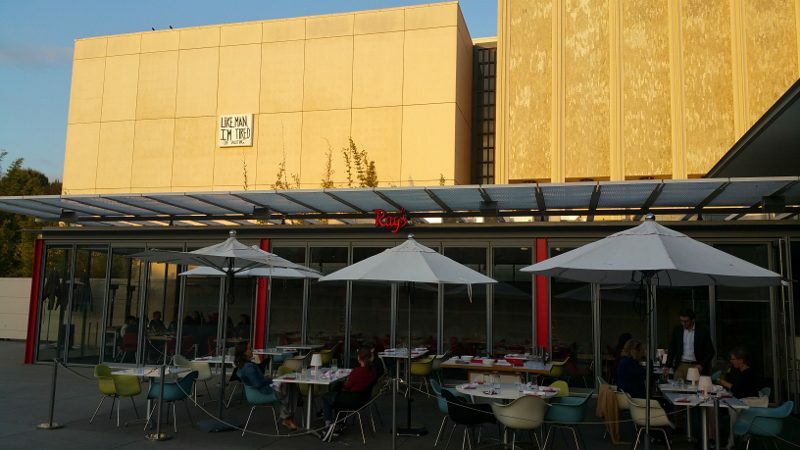 And at Ray’s and Stark Bar, the restaurant at LACMA, art is food. Inspired by the museum where Ray’s is located, Chef Fernando Darin has created an internationally inspired menu using local seasonal ingredients. But it is the plating that takes it from food to art. Chef Fernando Darin was born to an Italian family in a region of Brazil with Portuguese and African influences. He recently arrived to Ray’s and Stark Bar after working for Eric Greenspan, Michael Voltaggio and most recently for Patina at the Hollywood Bowl and the Walt Disney Concert Hall. Previous to cooking, he was a musician and artist for fourteen years. It is his global upbringing and artistic background that influence his food and drive his creativity. 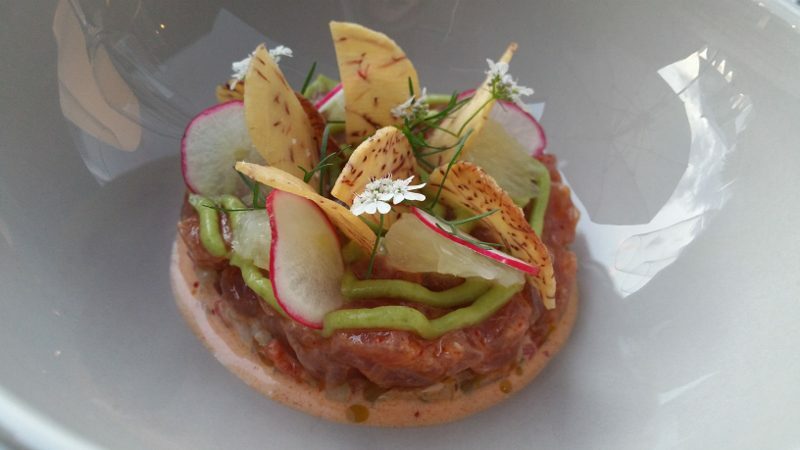 We started with the tuna tartare with avocado, oroblanco citrus fruit and taro chips and I was immediately transported to the realm of food as art. The presentation was like a beautiful art piece of art, balancing of color and dimension. The flavors are fresh and the oroblanca citrus brightens up the dish.